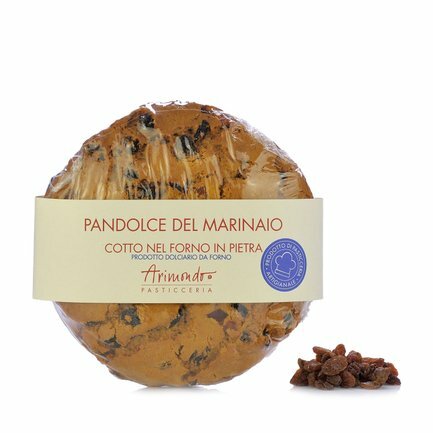 Eataly invites to discover one of the most traditional Ligurian desserts: Pandolce del Marinaio, baked in Arimondo's stone oven in compliance with time-honoured artisanal practices. The dough contains raisins, orange juice, candied peel and pine nuts, all high quality ingredients that combine to create the intense and persistent flavour of this regional speciality. Serve pandolce as an original dessert or enjoy it any time of the day when you feel like a delicious and superb quality snack. Ingredients '00' soft wheat flour, raisins, sugar, butter, orange juice, candied peel, eggs, raising agents (disodium diphosphate, bicarbonate of soda), pine nuts. ALLERGENS: wheat, eggs, milk-based products. For more information on product labels, please contact our Customer Service department. The information on the labels of the products may vary for reasons beyond our control, therefore, there may be discrepancies between the information on the site and that on the products delivered. Please always check the information on the product before consumption or use. Arimondo was founded in Genoa as a purveyor of exquisite delicacies made from carefully selected ingredients. The bakery that makes the products created by Arimondo for Eataly makes use of innovative production technology that is fully compatible with the need to preserve the flavours of times past to their best advantage. That's why savouring any of Arimondo's delicious products is like stepping into the past to experience the traditional and superbly crafted desserts of yesteryear. Eataly chose Arimondo because the firm reflects the principles of gastronomic excellence.